When dad would take us out to the old A&W drive in, I always chose tater tots over french fries. Tater tots were just more exciting too me. If given the choice between fries and tots, I pic tots every time. I think its that great contrast of crunchy outside and soft inside that I like. Sometimes I whip through a Whataburger for a taquito breakfast in a pinch. The cool thing about their meal deal is the "hash brown" is like a tater tot slab. Tater tots for breakfast. How cool is that? James Coney Island and their chili cheese tater tots also hit the spot on occasion. 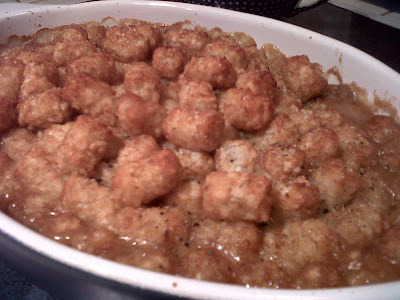 So Michelle tells me she is going to make tater tot casserole. I perked up in a hurry. Turns out that while attending Florida University she had this cook book called Six Ingredients or Less. She would make that dish because A) she was on a tight budget, and B) it was the pinnacle of comfort food at college at 2:00am with the drink yourself sober munchies. These days just 6 ingredients would cramp Michelle's style, but the essence of the comfort in this dish is not lost with her additions. Being the foodie she is, things like fresh garlic and Marsala are in play. She ends up with a refined comfort food dish. The basic flavors of comfort are there, but they are amplified to accommodate our present day pallet. This dish pairs well with watching a little TV. While fall is rushing in outside, the desire for comfort food builds inside me. The kind of food you want to eat without consideration of whether or not its good for you. Food that makes me wish that I never got full. Tater tot casserole is super simple. On some days that's just what the foodie in us needs.